The chemical ethylene glycol is used in the maintenance of radiators. It is very poisonous if it is accidentally ingested and can be fatal if the individual doesn’t receive the appropriate help on time [1, 2]. The substance known as ethylene glycol is the primary ingredient of about all radiator fluid products in the United Stated today. This is used to elevate the boiling point and reduce the freezing point of the fluid that circulates the radiator. Because of its properties, it prevents the radiator from overheating or freezing depending on the season when it is used [1, 2]. The naturally sweet taste of this odorless and colorless chemical is accountable for the tendency of cats and dogs to consume this fluid . Ethylene glycol is also used in the manufacture of detergents, paints, cosmetics, antifreeze and de-icing products . What is Ethylene Glycol Toxicity? When an individual consumes ethylene glycol, it will be metabolized by the body in the similar way that it metabolizes ethyl alcohol. Ethylene glycol in itself is not toxic but it is its metabolites that cause harm in the body. 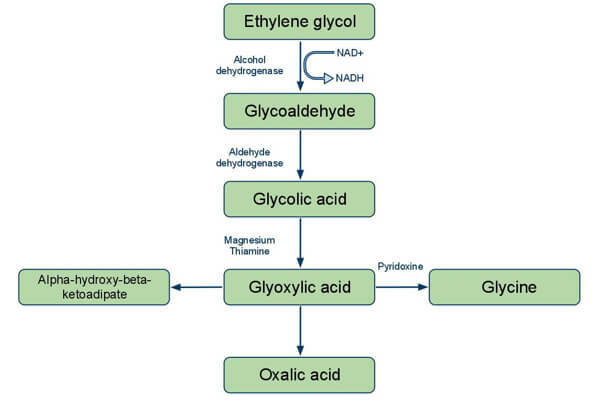 Ethylene glycol will initially be turned into glycolic acid which causes acidosis in the body. This will be further metabolized into the very toxic oxalate and circulate in the body. Oxalate consumes the available calcium in the body and forms calcium oxalate crystals. When these crystals accumulate in the kidney, it will cause a reduction in the glomerular filtration rate and lead to insufficiency of the kidneys. Studies have shown that ingestion of as little as 120 ml of ethylene glycol is enough to be fatal to an average-size man [1, 2, 3]. The initial effect of ingesting ethylene glycol is similar to consuming ethanol. They may appear to be drunk although there is no smell of alcohol on their breath. More toxicity symptoms will appear within a few hours of the ingestion. The patient may present with convulsions, vomiting, and nausea. They may even fall into stupor or coma. Drinking a large amount of this chemical can cause a damage in the brain, liver, kidneys and lungs. Aside from the metabolic acidosis that occurs, the condition will progress to shock, organ failure and death if it is not addressed immediately [1, 2]. The patient who is suspected to have ingested ethylene glycol and should be brought to the hospital right now. Information about the ingestion would be beneficial in the management of the patient’s condition. Knowing the type of chemical the patient has ingested, the amount, and the time the ingestion had occurred will help the physician . The initial priority when the patient arrives in the hospital is to maintain the airway. There is a risk for aspiration so the patient may be intubated to prevent this from occurring. An intravenous access will be established and crystalloid infusion will be initiated. This fluid will be able to facilitate an enhanced renal clearance of the chemical and limit the accumulation of oxalate crystals in the kidneys. A blood chemistry will be performed on a sample to identify the extent of the toxicity. Giving activated charcoal or performing a gastric lavage is not recommended because the chemical is quickly absorbed in the body [1, 2, 3, 4, 5]. Once the patient is stable, medications will be given to manage the condition. Bicarbonate is given to the patient in order to reverse the acidosis. This is initiated one the pH of the blood reaches 7.2. Pyrodixine and thiamine play a role in the metabolism of ethylene glycol and they are given parenterally to the patients. Those who manifest toxicity symptoms will be closely monitored until the serum osmolal gap reaches zero. Fomepizole or ethyl alcohol may be given as an antidote to help lower the osmolal gap. Hemodialysis is also seen to be helpful the treatment of metabolic acidosis and prevention of renal insufficiency in these patients [1, 2, 3, 4, 5]. If there is any indication that the ingestion of ethylene glycol is intentional, the patient may be referred to a psychiatrist for an evaluation and for possible interventions . The main way to prevent the accidental ingestion of ethylene glycol is to properly label the chemicals and keep them out of children’s reach. Any spillage should be cleaned immediately to prevent accidental consumption by animals [1, 2, 3, 4,5]. Accidental ingestion of ethylene glycol can be fatal and all measures to prevent this occurrence should be observed at all times. If you have more information about the toxicity of ethylene glycol, you can share it with others through the comment section below. You can also share this article on your social media sites to help spread the word about the dangers of ethylene glycol. Scalley, R. D., Ferguson, D. R., Smart, M. L., & Archie, T. E. (2002). Treatment of Ethylene Glycol Poisoning. American Family Physician, 807-813.